The Fair Trade Campaigns (Fair Trade Towns, Universities, Schools & Congregations) brought nearly 350 campaigners together for two and a half days to learn from one another, hear from producers and unite to increase our impact. 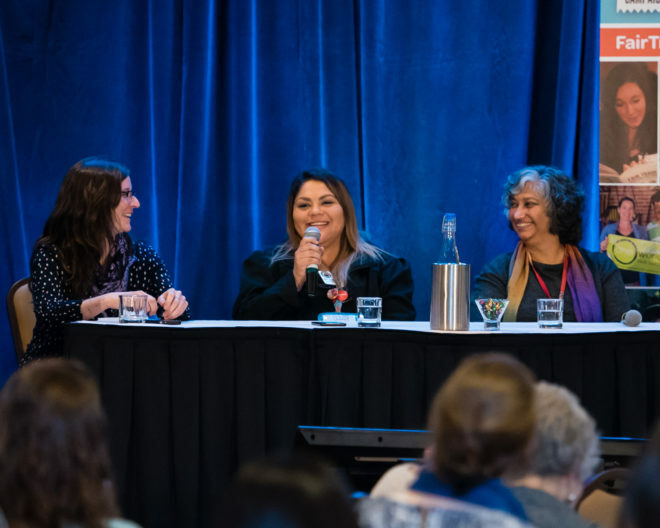 This past March, we came together with over 330 Fair Trade supporters and advocates to make new connections and dive deep on issues at the core of the movement. 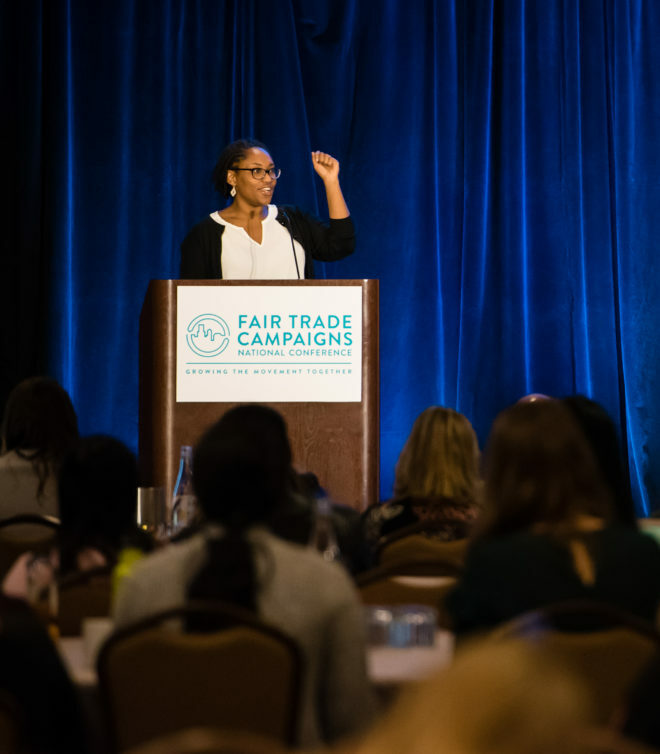 Over the course of three days, we heard from more than 50 speakers sharing their insights and expertise on Fair Trade, sustainability, social justice, community organizing, and much more. We've come away feeling so inspired and motivated to continue growing this movement with all of you. 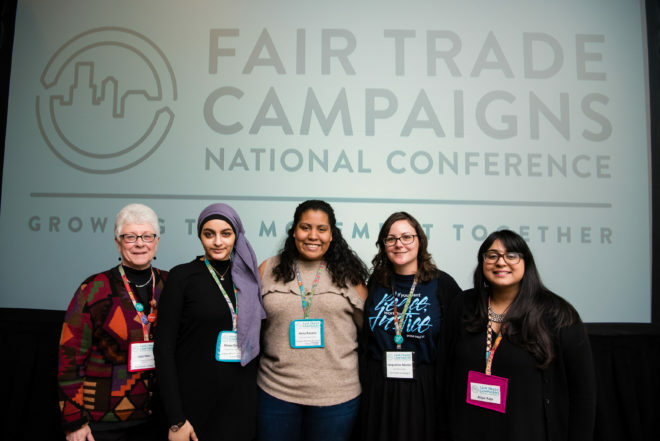 Throughout the conference, we explored topics within four focused tracks: Fair Trade at the Heart of Sustainability, Building a Diverse and Inclusive Movement, Driving Purchase to Drive Impact, and Colleges & Universities Driving the Movement. We heard from industry leaders about sustainability in apparel supply chains, explored approaches to inclusive advocacy and campus-community collaboration, and learned from the producers at the heart of Fair Trade, just to name a few. The focus of these tracks remains central to our work at Fair Trade Campaigns, and the ideas that emerged from these conversations will help us strengthen, deepen, and grow our Fair Trade network in the months and years ahead. We will continue aligning with leaders in sustainability and social justice. We will seek new opportunities to make our work more inclusive. We will educate and advocate to increase Fair Trade purchasing, on the individual and institutional level. And we will leverage the energy and influence of colleges and universities to advance all of these efforts. We were honored to host an incredible line up of keynote speakers, each of whom called on us to use our power to effect change. On Saturday morning, we heard from Fair Trade USA President and CEO Paul Rice and 1% for the Planet CEO Kate Williams. Rice called out to our collective efforts and our shared belief that the world's problems have solutions. And Williams reminded us of our power and responsibility as consumers to "pressure brands to respond in ways that create change." Opening the conference on Sunday, Dr. Marcia Chatelain, an associate professor at Georgetown University, demonstrated the connection between civil rights and consumer advocacy, encouraging us to "recognize where we stand and imagine better for the future." Stay tuned for more! Over the coming weeks, we'll be sharing videos from all of the general sessions. Subscribe to our YouTube channel to see when those go live, and follow us on Facebook, Twitter, and Instagram for more updates, events, and opportunities. Farmers, workers, and artisans are at the heart of all our work in support of Fair Trade. We were so grateful for the opportunity to hear voices from producer communities, and appreciate the dedication of those who traveled from across the globe to share their experiences. Anjali Schiavina, CEO of Mandala Apparels in India, highlighted the central role that women play in production, from the cotton farms to the factory, and the importance of gender equality. In talking about pushing for equal pay at her factory, she shared that the female workers asked to compromise, willing to earn a lower wage in order to avoid conflict and end a strike. "It is changing the mindset of the woman herself," said Schiavina, "to say that you need to stand up for your own dignity and for your own self respect, rather than just compromising. One compromise means hundreds of comprises every single day." Martha Quiroz, a pack house worker and the Fair Trade Committee Vice President at Wholesum Harvest, talked about the challenges of bringing her coworkers on board with the Fair Trade program. "The challenge was to make them believe in Fair Trade," she said. "It doesn't happen right away, and it's hard to believe when there's money involved." Wholesum Harvest has since established a strong Fair Trade program and invested premium funds in a variety of projects, including a health insurance program, a school bus, and a soccer field that has become the heart of the community. Joining us from Peru, Luis Heller, a board member with the World Fair Trade Organization, called on us to recognize and support small producers everywhere, setting aside the concept of the global North versus the global South. "We need to work together to solve these issues," he said, "to fight against poverty and for equality. It needs to be done in a global movement." As much as we were inspired, the conference also gave speakers inspiration to take back to their colleagues. Luis Miguel Garcia, General Manager of the Cooperativa de Caficultores de Anserma coffee cooperative in Colombia, stated, "After this meeting, I can go home with hope because I see that there are a lot of young people that are believing in [Fair Trade] ... So I see that there's a future in this and that people are aware that we should treat our producers well." Building on conversations about Fair Trade apparel and sustainable supply chains, we want to invite you to take part in Fashion Revolution Week (April 23-29). In the lead up to that celebration, help us raise awareness about Fair Trade apparel and demonstrate our shared commitment to ethical and sustainable fashion. We have four ways for you to take part - choose as many as work for you! Help us drive purchase to drive impact by purchasing a Fair Trade apparel item, or inspiring someone else to choose Fair Trade for their next clothing purchase. Tell us about your purchase on social with #FTConf2018 and #whomademyclothes. Help us demonstrate the link between Fair Trade and sustainability, by posting about your purchase and sharing information about Fair Trade apparel and sustainability. Tag your post with #FTConf2018 and #whomademyclothes. Not sure what information to share? We have 101 guides to help you out! Check out these resources on Fair Trade apparel and environmental sustainability. Help us spread the message far and wide by tagging friends and organizations who can help us reach a wider audience. Help us harness the purchasing power of colleges and universities. For all our campus organizers, we challenge you to make Fair Trade apparel available in your campus bookstore. Start with one item, or add another if Fair Trade clothing is already being sold. Don't forget to tag us @FTCampaigns and use #FTConf2018 and #whomademyclothes. And now, a few thank yous. Thanks to Georgetown University and Aramark for being gracious hosts. Thanks to the Stiller Family Foundation for supporting the attendance of almost 100 Fair Trade organizers (pictured below). Thanks to Fair Trade USA for their ongoing support, and for all the knowledge their staff brought to the event. Thanks to Kroger for sharing their sustainability commitments, including their recent trip to see Fair Trade coconut production in the Philippines. And huge thanks to all of the sponsors who helped make this event such a success!